The IPSA created this new Scene Safety infographic for free download, printing and sharing. Duty. Honor. Courage. Noble words to live and serve by. The epitome of those words was sadly reinforced recently as the public safety community of practice lost seven brave souls in the line of duty. In the one week from March 21 to March 28, 2018, the United States has averaged the loss one first responder per day. Wednesday, March 21, 2018: Police Officer Andres Laza-Caraballo (age 31) of the Juncos Municipal Police Department in Puerto Rico was shot while off duty when attempting to intercede in a violent incident. Officer Laza-Caraballo confronted armed men when they entered a barber shop and began firing. Officer Laza-Caraballo was fatally wounded. He was a 10-year veteran of the department. He leaves behind two children. Thursday, March 22, 2018: FDNY Firefighter Michael Davidson (age 37), a 15-year veteran, husband and father of four girls, died in a fire on a movie set in the Hamilton Heights neighborhood of Harlem. Part of an interior attack crew, FF Davidson became separated from the others when an evacuation was called. Search teams were quickly assembled and re-entered the building in a desperate attempt to locate FF Davidson. When found, FF Davidson was unconscious. He was transported to Harlem Hospital where he died. Also on Thursday, March 22, 2018, in York City, Pennsylvania, FF Ivan Flanscha (age 50) and FF Zachary Anthony (age 29) perished in a huge multiple alarm fire in the former Weaver Organ and Piano Warehouse. FF’s Flanscha and Anthony were part of an interior crew dousing hot spots when a part of the structure collapsed, entrapping them and other members. The York City Technical Rescue team was brought in to lead the search, but unfortunately, both Flanscha and Anthony did not survive. Two others, Assistant Chief Greg Altland and FF Erik Swanson received serious, but not expected to be life threatening injuries. In what is becoming a more frequent and tragic consequence of exposure to hazardous substances, Special Agent Melissa Morrow (age 48) of the FBI succumbed to brain cancer on March 22, 2018, because of her search and recovery work at the Pentagon on September 11, 2001. She worked 10 weeks on site, and like many first responders, fell from continuous, long-term exposure to toxins. She is survived by her parents and one sister. Friday, March 23, 2018: The Caldwell County Office of Emergency Management reported that FF Larry Marusik of the Ellinger Volunteer Fire Department succumbed to critical burn injuries sustained on March 10 while fighting a large wildland fire. He had been under treatment at the Brook Army Medical Center. Saturday, March 24, 2018: We saw the deaths of two Pratt, West Virginia, volunteer firefighters who died in a crash of their apparatus when responding to a severe multi-fatality traffic accident. Preliminary reports show that their rig left the roadway and crashed into a rock wall. Three other firefighters were injured, one critically. Improve situational awareness. The key is situational awareness and the responder wearing the proper protective gear for the environment where he or she is responding. Situational awareness is enhanced when 9-1-1 dispatchers inquire about the circumstances and environment and report their findings to responding units. Implement practices to reduce contamination. All agencies should assess their risks based upon their unique response profile and adopt policies that reduce the risk of contamination. This would include the adoption of operational practices such as mandatory post-fire decontamination, cleansing of PPE, carrying contaminated PPE in sealed bags and assessing personnel for exposure. Always wear a seatbelt. Empirical research shows that wearing a seatbelt will save lives. First responders need to buckle up, despite any temporary discomfort duty gear may impose. Enhance body armor by decreasing its weight and increasing flexibility, provide for more coverage, and enhance it ballistics, shielding capabilities. Body armor should protect vital areas against any form of penetration, whether a projectile from a firearm or a penetrating object intended to stab the officer. A proposed revision of NIJ Standard 0101.06, Ballistic Resistance of Body Armor is open for comment through May 23, 2018. Increase firearms training. Law enforcement officers are required to undergo a certain number of hours of firearms training. Unfortunately, the time allotted for training is generally very limited and does not correlate to the volume of gun violence in the U.S. Departments need to review their training hours and add training hours to keep their officers safe. The IPSA Executive Director's Policy Task Force developed a series of InfoBriefs on Homegrown Violent Extremism. The IPSA encourages you to download, review and share these documents with your professional network. To learn more about the Policy Task Force and to get involved with future projects, visit our Policy Task Force webpage. First responders experience extreme physical demands, often in hazardous environments. Many tragedies occur suddenly and without warning. Gunshot wounds, building collapses, vehicular accidents, assaults and other causal factors contribute to untimely deaths in our emergency response community. Further, first responders face several threats to occupational related diseases such as cancer and cardiorespiratory related maladies. Law enforcement, firefighting and rescue activities are inherently dangerous occupations. Since the year 2000, the data reviewed accounts for the loss of 2,841 law enforcement officers, 1,937 fire and EMS personnel and 233 K9s. The International Public Safety Association Memorial Committee was established to monitor line of duty deaths to honor the supreme sacrifice of our brave and heroic first responders and to review LODD data for trends, patterns and anomalies so the IPSA can develop recommended policies and changes that improve safety. If you are interested in getting involved with the IPSA's Memorial Committee, then apply to serve today. How do law enforcement officers end up chronically stressed, burned out and suffering from compassion fatigue? Why do so many officers fail to take care of themselves mentally and physically? And how can we help them achieve better health and balance? In part, this shift is driven by sheer economics—recruiting is getting more and more difficult for law enforcement agencies, so we need to find ways to retain good officers. But scientific developments are also driving the change. We’re learning more about the essential connection between mental and emotional health and performance. And that changes job-related stress from something we should just “deal with” to something that presents significant risks for law enforcement agencies. There’s no shortage of stressors in law enforcement. Depending on where you live and work, you may face media scrutiny or community distrust. Then there’s the grind of responding to call after call where people are exhibiting their worst behavior or are victims of someone else’s bad behavior. But let’s focus for a minute on two even bigger factors that underlie these specific stressors. First, law enforcement officers are hard-wired to focus on the negative. We are always in threat assessment mode. All the way back in the academy, we were taught to focus on the bad things that can happen—because doing so could save our lives one day. This hard-wired approach to focus on the negative can take its toll and make it difficult to differentiate situations where we should be looking for the positive. Second, law enforcement today is an all-encompassing, 24/7 career. There is a high level of responsibility that comes with being a protector of the public. Coupled with that, law enforcement culture expects officers to be stoic and strong in the face of adversity. We are taught to resist normal physiological responses to tragedies or critical incidents. This combination creates a perfect storm: The profession becomes all-encompassing, but at the same time we don’t provide officers with tools to deal with the effects of the profession. How do officers know when they’re stressed? Stress is mental or emotional strain or tension resulting from adverse or very demanding circumstances. Burnout is the cumulative process marked by emotional exhaustion or withdrawal associated with increased workload or institutional stress. Compassion fatigue is the emotional residue/strain of exposure to working with those suffering traumatic events. It can encompass physical symptoms, such as difficulty sleeping, and emotional symptoms, such as loss of self-worth or anger. How does police officer stress manifest itself? Most of these signs and symptoms can be traced back to depleted energy. The answer to the devastating consequences of police officer stress is self-care for mental health. You may have heard this term tossed around, but what does it really mean? Self-care is not an exercise regimen or seeing a psychologist (although it could encompass those things). Rather, it’s a conscious process of considering our needs and seeking out activities and habits that replenish our energy—so that we can do our jobs better. This last part is often difficult to understand. Type A personalities often lead individuals to believe that they do their best when they commit all their resources to something, working harder and harder. But that’s simply not true. We only have a finite amount of energy each day to expend. Just as taking a day off from the gym can help us train harder the next day, participating in activities outside law enforcement helps us refuel emotionally, which makes us more effective when we go back on duty. Combating the negative mindset also comes into play here. When you consider that negative emotion burns twice as much energy as positive emotion, the challenge and skill to remain positive makes its own case. We need to train officers to regularly assess their energy levels and focus on the positive. One way to do this is by applying the “For vs. To” test to reframe an experience. Saying that something happened “to me” makes the experience negative and victimizing. Saying that something happened “for me” immediately turns the experience into a positive event and creates a challenge for officers to better themselves by developing their leadership and coping skills. Everything is a lesson and at minimum, in every tragedy/critical incident, there is a test of humanity. That test can develop good character if administered correctly, and should allow officers to feel relief instead of regret. The lesson is to not allow a temporary event to become a permanent state of mind. Another important factor to understand about self-care: It’s a perishable skill, just like driving, shooting or arrest and control techniques. To be successful in maintaining good mental health, officers must practice. So let’s look at a few ways to do just that. As mentioned above, Dr. Kimberly Miller presents frequently on the topic of self-care. She uses the analogy of “filling one’s bucket” with coping mechanisms that help officers stay positive, develop identity and self-worth outside of law enforcement, and be more in touch with their feelings and emotions. Here are three self-care tools she teaches. Cultivate a life outside law enforcement. Good bucket-fillers create time for relationships and activities outside of the work environment. Don’t short-shrift your spouse, children or friends for work. Because it can be hard to let go of the job even when you’re off duty, you may at first need to schedule planned activities with family and friends. Otherwise, you may find that you spent yet another evening stewing over the day’s events while your kids played games on their tablets in the other room. Remember, too, that “alone time” is beneficial. Find activities—hiking, swimming, reading, bird watching, listening to music—that you enjoy and make time for them, too. Other tips: Disengage from technology whenever possible or at prescribed times of the day or week, and avoid energy “vampires” (people who demand too much of your energy). Develop good physical health habits. Dr. Miller also suggests committing to an exercise regimen—one you can maintain. Consider whether you need to improve your diet, too. Law enforcement officers often find it difficult to eat healthy on shift, but preparing meals in advance can help. Cooking can also be a great way to spend quality time with your spouse and/or children. Finally, do everything you can to get enough sleep. Most people need between 6 and 9 hours. Lack of sleep is linked to many adverse health effects, even cancer, and can worsen the effects of post-traumatic stress. I know it’s not always possible, but when you can, plan for appropriate sleep time to avoid starting the day already low on valuable energy. Practice meditation and mindfulness. Dr. Miller and I agree that visualization, meditation and mindfulness also have promise as a focused method of improving the mental health of officers. Visualization is a type of meditation about a specific activity or outcome and is widely used by professional athletes to focus on performance. Police officers are very much like professional athletes and this method should be considered as a part of any self-care program. Meditation is focused on trying to empty one’s mind of everything so that it can re-charge or clear the memory of negative thoughts. Mindfulness is a technique I’ve written about before; it involves paying attention to thoughts and feelings and how they are affecting you, then altering the thought process to deal more effectively and efficiently with the feelings. Our society praises selflessness. That’s understandable; our natural inclination is to put ourselves first, and learning to push back against that impulse makes us better citizens and human beings. But like any habit, selflessness can become an addiction. What we often see in law enforcement officers is dedication to the job taken to an extreme. And like any addiction, over time, it begins to cause problems—physically, mentally, emotionally. Law enforcement agencies have typically done a poor job of understanding police officer stress and helping officers cope. That needs to change. We need leadership role models who will demonstrate the important of actively choosing a balanced lifestyle. We need peer support and supervisors who show officers that it’s OK to feel pain and emotional distress—that doing so builds resilience over time. We cannot give away what we don’t have; unfortunately, too many officers don’t understand this concept. Today’s officers require a new kind of bravery: The courage to change hard-wired habits and commit to self-care. This is not something we can put off to deal with in retirement—or we might never get there. When it comes to positive mental health, we simply can’t afford to trade the now for later. Dan Fish is Professional Services Representative for Lexipol. He retired from law enforcement in May 2017 after a 30-year career where he served in all ranks of the Petaluma (CA) Police Department including Chief of Police. Fish earned his bachelor’s degree in criminal justice from Sacramento State University and he holds a graduate certificate in law enforcement leadership from the University of Virginia. He holds several California certificates including the POST Management Certificate and the Phi Theta Kappa International Honor Society Leadership Development Program. Fish is a graduate of the POST Executive Development Course and Command College, the LAPD West Point Leadership Program and the FBI National Academy session #263. After nearly 30 years of serving in a variety of public safety positions, one common theme always emerged, the importance of mental and physical health/fitness. 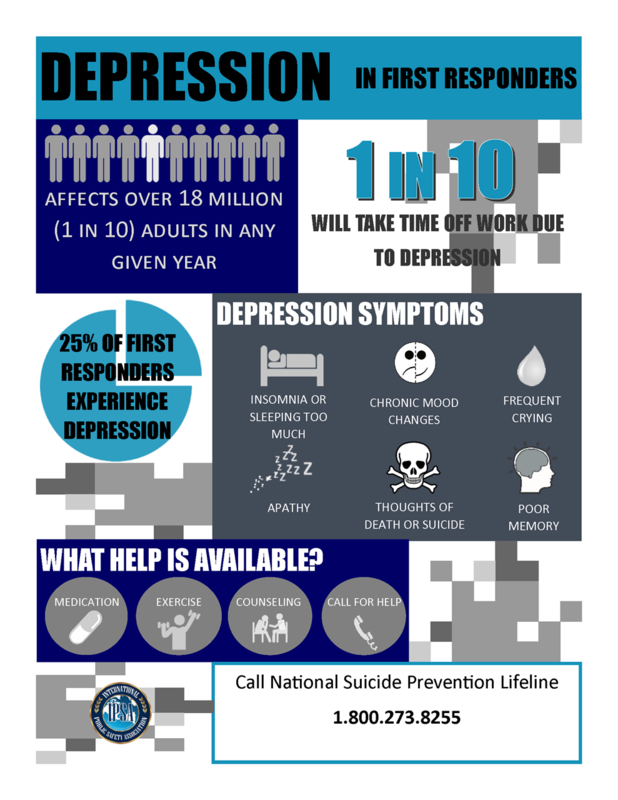 Even today, mental and physical health/fitness is still under-addressed in 911 telecommunications, law enforcement, corrections, fire/EMS, emergency management, public works, public health and all related public safety professions. In 2011, I transitioned from the field to the classroom as a criminal justice professor. I’m presently teaching the next generation of public safety professionals about strategies to prevent and reduce stress. 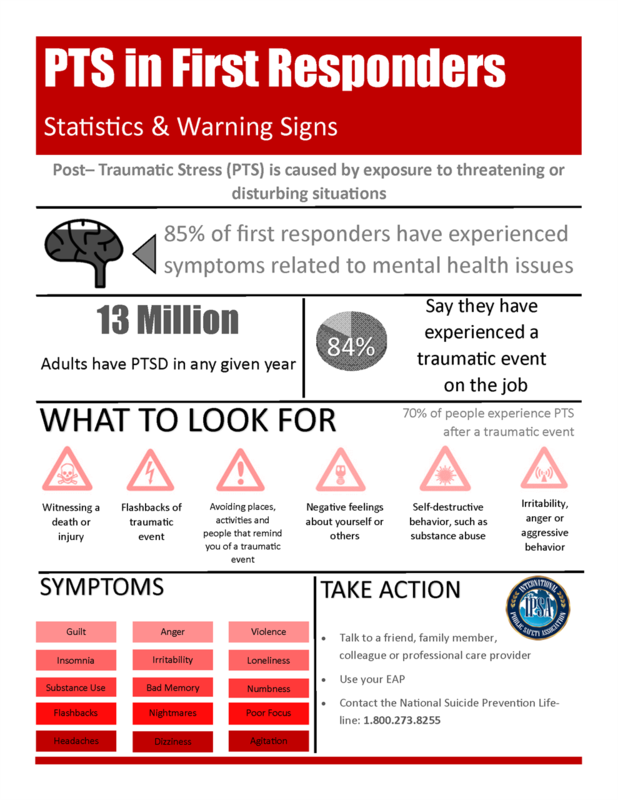 Consistently, medical research illustrates that stress contributes to a host of mental and physical ailments stemming from the public safety profession. This is not surprising given that the public safety profession represents some of the most dangerous, demanding and physically/mentally exhausting occupations. Here are some examples. According to the National Institute for Public Safety Health, the average age of a first heart attack in the United States is 66, whereas the average age of a first heart attack for a firefighter is 49. In comparison with the general population, law enforcement officers have higher blood pressure and cholesterol levels. 40 percent of law enforcement officers have a sleep disorder, which places those officers at a higher risk for depression, stroke, obesity and on-duty related accidents. A profession that has been mostly neglected, as far as stress-related research, is that of correctional officers. 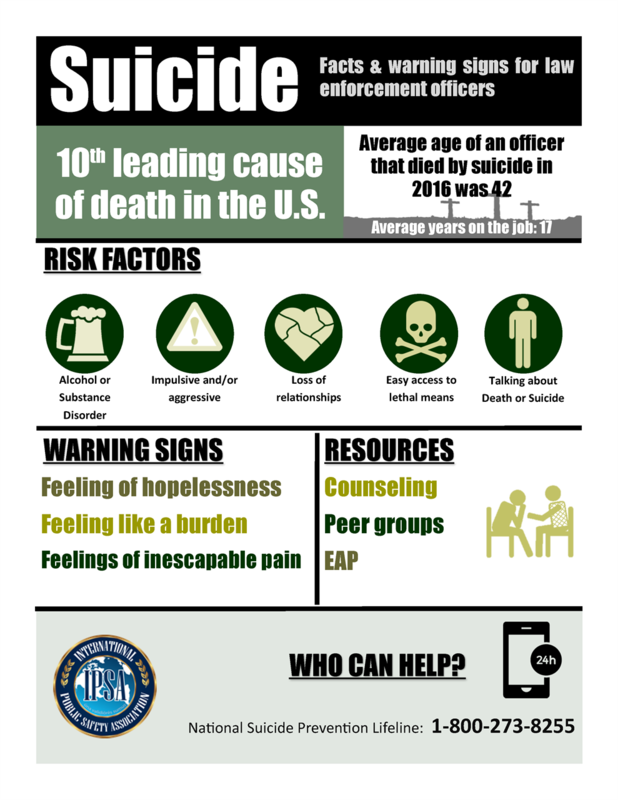 Correctional officers have a suicide rate that is twice that of the general population and some studies suggest that the suicide rate is even higher than that of other law enforcement officers. Even more disturbing is that, on average, correctional officers will not live to see their 59th birthday. There is a need to provide information, education and awareness to public safety professionals. There is also a need to develop prevention and intervention strategies designed to address the physical and emotional wellbeing of all public safety professionals. Below are some methods for coping with stress. This is not a complete list, and it is not a simple solution to a complex problem, but it is a good place to start. Minimize unnecessary stress in your life: Stress is a part of life. There is truly no way to escape it, but everyone can minimize unnecessary stress. Unnecessary stress is often the stress that is created in our minds, whether real or perceived. For example, I would become so frustrated when I came home from work and my kids left the kitchen a mess. While I still get angry and frustrated, I have learned that teenagers are simply lazy and rebellious at times, so I do not allow it to upset me as much as it did in the past. Change the way you react, respond to stress: This is along the same line of thinking as the above. How we react and respond to stress can be controlled with some time, patience, effort and practice. Everyone needs to learn how to recognize the physical and emotional signs and triggers. Know and identify when you are becoming stressed and learn how to self-calm. Accept the things that you cannot change and are beyond your control: As a former Executive Director of an outpatient substance abuse facility, this is a phrase that became part of our daily mantra. It is also a common saying in both Alcoholics Anonymous and Narcotics Anonymous. It holds true here as well. Adopt a healthier, happier lifestyle: Public safety professionals work with the public. This includes toxic individuals in toxic environments, which often leads to cynical and jaded thoughts. Given the reality and scope of the work environment, surround yourself (at least outside of work) with positive, supportive individuals. Engage in a hobby or do something that makes you happy. Make the time to exercise. Exercise helps reduce stress, depression and anxiety. It will help push negative thoughts aside. Learn to say “No”: Several strong type-A personalities struggle with this one. Think before you commit to a new task. Take a day or two before giving an answer. Saying no helps keep your life in balance. Many individuals look at the glass as being half-empty as opposed to being half-full. However, if you sit down and evaluate your life, you will determine that the positive things in your life outweigh the negative. Redirect your negative thoughts to the positive. Despair, hate, bias and crime are world-wide problems. That’s a reality that will likely not change in the near-term. However, given that this won’t change, it is incumbent on us to focus on the positive achievements we perform every single day. Public safety professionals help people, save people and we protect people. That is what we do, we need to be proud and we need to focus on that. Laugh more, criticize less: Humor and laughter helps to ward off stress. Avoid getting together with friends just to commiserate about your day. That is not healthy. Instead, hang out with friends and family members who enjoy a good laugh. Distance yourself from toxic friends and family. Compartmentalize: One of the most helpful strategies that has worked well for me is to compartmentalize. Compartmentalizing is a psychological concept that can be used as a coping, defense strategy when dealing with conflicting internal events simultaneously. In other words, leave work at work and home at home. When the two carry over from one aspect of your life to the other, problems become compounded. Change must be embraced: To change our thinking, behaving and acting, we must embrace change. Thinking about changing is not sufficient. Everyone must take daily action steps toward change. These steps often take us outside of our comfort zones. As the late Jim Rohn, an entrepreneur, author and motivational speaker, previously stated, "Your life does not get better by chance, it gets better by change." Dr. Michael Pittaro is an Assistant Professor of Criminal Justice in the School of Security and Global Studies (SSGC) with American Military University and an Adjunct Criminal Justice Professor at East Stroudsburg University. Dr. Pittaro is a criminal justice veteran, highly experienced in working with criminal offenders in a variety of institutional and non-institutional settings. Before pursuing a career in higher education, Dr. Pittaro worked in corrections administration; has served as the Executive Director of an outpatient drug and alcohol facility and as Executive Director of a drug and alcohol prevention agency. Dr. Pittaro has been teaching at the university level (online and on-campus) for the past 15 years while also serving internationally as an author, editor, presenter, and subject matter expert. Dr. Pittaro holds a BS in Criminal Justice; an MPA in Public Administration; and a PhD in criminal justice. By design, active shooter hostile events or mass casualty incidents are used to cause wounding and death on a large scale. As public safety agencies work toward appropriate responses to ASHE/MCIs, whether in the form of a shooters, bombers or any other hostile means, the MCI aspect of the response plan is often lacking. Law enforcement must continue working with their public safety partners to gain rapid access to an unstable and dynamic situation, and the medical community also needs to be included in the response model. The rescue task force concept of providing immediate medical care to the injured during an ASHE/MCI is gaining traction. As the incidence of ASHE/MCIs rise in U.S., the evidence of RTFs saving lives is also growing. While many jurisdictions are implementing RTFs, as we saw in the 2017 Las Vegas shooting, several agencies have not adopted the concept. This article examines two jurisdictions in the United States and highlight the common goals, problems and some unique situations present in various ASHE/MCI response models. Springfield is the capital of Illinois and is in Sangamon County. In a city of 118,000 people and a county of 245,000, there are two different level-one trauma centers. With over 20 fire departments and EMS providers along with 25 law enforcement agencies, getting all of them on the same page is difficult. Complicating the ability to synchronize various agencies is the composition of the departments. Three private ALS EMS agencies provide the bulk of the transport in Sangamon County, and law enforcement agencies range from a two-member department to a 245-member agency. In Springfield, as the planning and training for implementation of the RTF concept has evolved, casualty triage has taken a more prominent position in the overall concept of operations. In the Springfield program, the contact team is tasked with neutralizing the threat. This is common in most RTF plans. The contact team is directed to notify incident command about the location of victims, and if possible, the number and condition of the injured. The first RTF to enter the crisis site and begin the treatment and evacuation of the casualties has a rather simple triage method, dead or not dead. As the RTF moves through the area, patients are treated and marked for evacuation, or if capable of movement, directed to exit the site through the same path the RTF and contact team entered. While some may argue it is dismissive to triage with the categories being dead or not dead, the purpose for the initial RTF is to quickly assess patients with easily correctable life threats and then move on to the next patient. After this is completed, then additional RTFs are tasked to evacuate casualties and re-evaluate patients using the more traditional START methodology. This includes reassessing patients marked as dead, unless there are obvious non-survivable injuries. In the revised MCI plans, the four-category START system is fully implemented at the warm-zone and cold-zone interface. MCI plans need to include first responders (law enforcement, fire/EMS and 911 telecommunicators) and local hospitals. Many hospitals are unprepared, and if a MCI comes to their facility or if there is a potential for violence at the medical facility, they will simply call law enforcement to secure the facility. Often the reality is that during an ASHE/MCI, law enforcement will be deployed to the crisis site. The agencies that are adjacent to the stricken jurisdiction will be involved in assisting their sister agency with response on site. In short, law enforcement resources will be scarce when it comes to the physical security of medical facilities. Several recent ASHE/MCIs have occurred when key hospital administrators and management personnel were not on shift. Therefore, hospital administrators and managers need to have policies in place that allow the movement of less critical patients from critical care beds to waiting rooms or treatment by physician extenders such as nurse practitioners and physician’s assistants. Along with written and legally reviewed policies, charge nurses and unit managers need to be trained and empowered to make those treatment decisions, in consultation with the emergency department, attending physicians and where applicable, trauma surgeons. Each of the level-one trauma centers in Springfield operates its own EMS system. To the benefit of the community, the EMS protocols are nearly identical which aids in reducing confusion in providing pre-hospital care. The MCI protocols for both systems are the same. They use the START triage system. However, there are some limitations with solely relying on the START system. For example, while it is designed for MCI situations, it does not address active threat environments. In the high stress and dynamic environment of an active threat, MCI is often the most overlooked aspect is the triaging and evaluating casualties. MCI planning must consider patient transport. During crisis, patients are arriving at medical treatment facilities by conventional EMS transport, law enforcement transport and/or self-evacuation. This model, while difficult to control during chaos, may create an unintended reverse triage. Patients that are capable of self-evacuation often are not severely injured, and they will likely arrive ahead of the patients who are in dire need of medical interventions, especially resuscitation and surgical intervention. During an MCI and patients are being transported, there is a misconception that law enforcement will be available to secure medical facilities. There may also be a perception that the hospital’s internal security will be able and capable of controlling access to the hospitals, especially the emergency department. This is not typically the reality. Another area for improvement is community resilience. In central Illinois, the HSHS St. John’s Hospital Trauma Team is using outreach education to teach Stop the Bleed to local fire and law enforcement agencies. The next goal is to implement a program like Davie, Florida and get bleeding control kits in the community with AEDs. Davie is a highly populated town located in Broward County, Florida. Most agencies agree the public needs to get involved in rendering immediate care for someone that is severely bleeding. In October 2015, the Davie Fire Rescue was recognized at the White House/Department of Homeland Security for their innovation in developing Severe Bleeding Kits and distributing the kits to all their AEDs. In addition, they incorporated the severe bleeding training into all their CPR/AED classes. They have renamed the program to coincide with the DHS program – Stop the Bleed. Since the early 2000’s, several issues were identified regarding MCI management in Broward County. The biggest issue was that each of the 20 fire-rescue agencies in Broward County had adopted their own MCI plan. When mutual aid was provided from neighboring departments, as is frequently seen during MCIs, this led to multiple levels of confusion. The region identified the need to correct this problem with all agencies in Broward County agreeing to a single MCI protocol that consisted of common terminology, triage and tagging methods. This has greatly improved MCI management, which expanded state-wide. In early 2004, Florida’s EMS Advisory Council approved and recommended a MCI procedure and a state-wide MCI triage tag. Funding was secured through DHS grants for the state to supply all ALS agencies with MCI equipment. This included a common field operation guide, field unit bags with personal triage fanny packs, MCI tags, colored tarps, identification vests and MCI trailers. To ensure all first responders were using the same guidelines for MCI management, the procedure was placed in the Florida Fire Field Operations Guidebook. This FFOG, funded by the State Fire Marshall’s Office, was provided to every first responder vehicle (law enforcement, fire and EMS) within the state. State-wide strides were made to prepare all first responders for MCI management, but equipment and procedures are not enough. There remains an on-going need to continually train, utilize and refine the procedures to ensure a constant position of readiness. Unfortunately, what was encountered 20 years ago with MCI management in Florida, is now occurring with the fire-rescue response to an ASHE/MCI. Law enforcement and fire-rescue agencies across the county and state are now developing their own sets of procedures and terminology. The RTF concept is gaining in acceptance, but it is still not widely adopted. Some agencies fear that their personnel may get injured. Other agencies debate whether RTF personnel need to have full ballistic protection. Davie Fire Rescue has trained all personnel in RTF with classroom training followed by walk-through exercises and several full-scale exercises. The biggest obstacle we face is creating a true unified command. As we train more with law enforcement, we will see improvements. Most fire-rescue agencies see the need to change our response to an ASHE/MCI. They see the need to get-in quicker to stop the dying, but there is no consensus on what this model looks like. Fortunately, there are several excellent resources now available through the International Public Safety Association, and even the National Fire Protection Association has a committee working on Active Shooter response (NFPA 3000). As active threats continue to evolve, first responders, medical treatment facilities, community leaders and civilians must evolve their training and response. This International Public Safety Association InfoBrief discusses how and why the Stop the Bleed program was developed and how it is being implemented and recognized globally. Further, it examines funding strategies discusses how to get involved in the Stop the Bleed movement. Stop the Bleed is a national awareness campaign and a call to action. It is intended to promote community efforts that encourage bystanders to become trained, equipped and empowered to help in a bleeding emergency because a person with a life-threatening injury from a motor vehicle collision, a stab wound or a gunshot wound can bleed to death before first responders arrive. The bystander acts as the first responder and are the first point of contact in the chain of survival. The beginnings of one emergency number in the United States can be traced back to the driving force of the coordinated efforts of members of public safety moved to service. Professional firefighter and law enforcement associations went to Congress on behalf of the citizens they serve requesting one nationwide emergency number, spanning the course of decades. Download the Interational Public Safety Association's InfoBrief 9-1-1 Emergency Communications Celebrates Golden 50 Year Anniversary in the United States on February 16, 2018.